Our latest Insider will accomplish an important milestone next month - graduating from high school. Meet Darryl Smith Jr., senior class president at Urban Prep Charter Academy for Young Men - Englewood Campus and future entrepreneur. Darryl and his classmates beat the odds so often associated with young black males and they have much to be proud of. Members of Urban Prep’s class of 2013 have been accepted to over 115 four-year colleges and universities including Cornell University, Morehouse College, Howard University, The University of Notre Dame and The University of Pennsylvania. 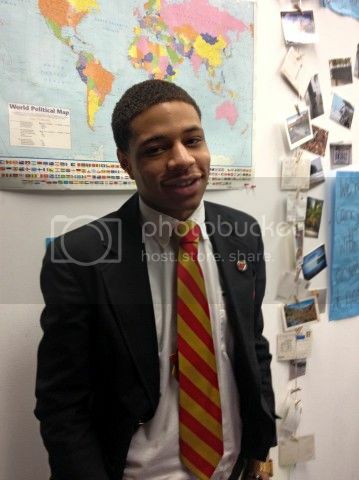 A smiling Darryl is pictured wearing a red-and-gold striped tie that signifies his college-bound status. He plans to attend Beloit College in Wisconsin this fall. Read on to learn Darryl’s thoughts on the youth violence crisis in Chicago, his most memorable experience as a student and his advice for freshmen students in this second in a series feature on Urban Prep Academies. Congratulations on your upcoming graduation! Please share with us, what are your career goals and how did Urban Prep support you? My career goal is to become an entrepreneur and someday open a community based mental health clinic for youth. This idea was inspired by my interactions with Urban Prep’s Founder and CEO, Tim King. His passion and vision for opening Urban Prep closely align with my own goal of beginning a community clinic. He showed me that my dream can become a reality, no matter the obstacles in your way. What are your thoughts on the violence epidemic among Chicago's youth? How can adults and the community support youth to make sure they are safe, stay in school and graduate? My thoughts on the violence plaguing Chicago’s youth are not positive. It’s completely criminal that my fun and exposure to certain parts of the city are limited because I fear for my safety when traveling anywhere outside of my house -- and that includes to and from school. Adults need to stop stereotyping, and step out of their comfort zones and adopt an at-risk child as a mentee. I feel that the youth won’t grow if the teachers (elders) are too afraid to work with them. You will soon join the ranks of Urban Prep alumni. What is one of your most memorable stories of your time there? After a rough start during my freshmen year, I was very disgruntled with the school and wanted to leave. However, I gained a small circle of friends that helped me get through the rough times. If I had left Urban Prep because of those bad experiences, I wouldn’t be the man I am today. Staying here made me a man. It helped me realize my potential for overcoming adversity and staying focused on the end goal; becoming an Urban Prep Man! What advice would you give to the new freshman class entering Urban Prep this fall? Just as I tell my little brother, Dominic Smith (Urban Prep-ENG class of 2016), recognize that the challenges placed before you by other students, teachers, principals, coaches, etc. are all part of a larger plan to build you up into an unbreakable man. Go with the program, it works. You’re going to hear about my success soon; and when you do, trust that I will owe a big part of it to Urban Prep. We look forward to hearing about your success Darryl! Read the first post in this two-part series here.